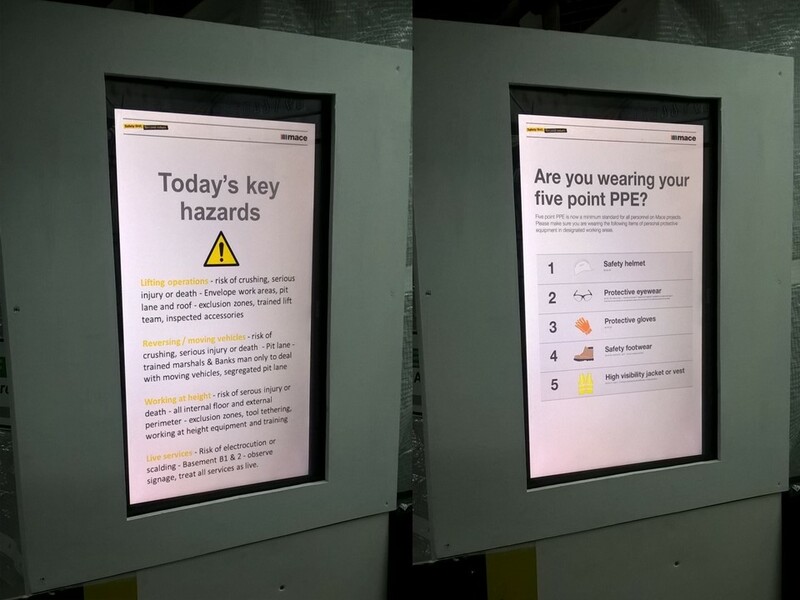 A new system for displaying health, safety, well-being and environmental information has recently been installed at the UCLH P5 project. Digital display boards are a useful instrument on construction sites. However, they are often expensive and need a large area to be installed within. With a very small footprint, UCLH P5 wanted to find a digital display board that did not take up much room on site and was easy to update by the Project Team. Hard Hat media was able to provide a board that fit all the requirements and it is now installed on site. It has been a very effective way of displaying health, safety, well-being and environmental information. Very easy to update information through Microsoft PowerPoint. Cost effective at £104 per month, per screen. This is half the cost of other digital boards. Weighs less than 18kg so it is lightweight and easy to move and install. The enclosure is vandal proof. Smaller size of 28 inches. Additional content available includes UV index, weather graphics and a TfL service board.